Here is absolutely the very best Computer Training Course you could ever find. It's taught by Gus Frantz a retired college teacher and a 15 year Certified Professional IT Computer Technician. There are 2 major courses both with clear detailed pictures to guide you in every step by step topic of learning the Windows 7 System. First you will learn Basic Computer which begins with all the simple tasks like your Desktop Filing System, Making Files and Folders, Shortcuts, how to Move, Cut, Copy and Paste. And then moves on to how to keep your Windows System Running Fast and Secure. 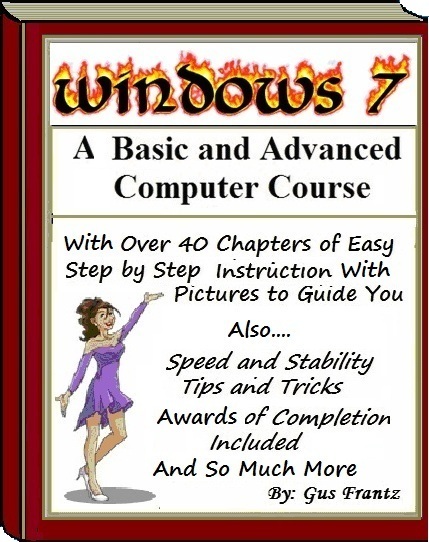 You will learn all of the Windows Keyboard Shortcuts and Applications like Paint, Notepad, WordPad, Registry Editor and how take Full Control as the Administrator, Screen Capture, Searching Files, and Folders, Extension Files, Tips, Tricks and Tweaks along with 20 FREE Must Have Utilities to train you the Student to be a Master at Windows and so much more. The Second part to Basic Computers is Advanced Computers which goes deeper into the Windows System showing you how to Improve Performance, what to do if Windows Crashes and Wont Boot Up, how to get your Own Driver Data Base, Securing USB Drives and how to By Pass the Log On Password of a Protected Windows Computer. There are even some Fun Pranks you can play on your Friends as well and many Lessons on Simple Programming. You will learn to use the Windows Tools. And most importantly, how to make a Backup Image of your entire Windows System and how to Recover Deleted or Lost Data. Copy and Create your Own Movie Collection. How to Make your Own Website. There is so much information here that it would take you months to find how to do it all. Also an additional 40 Great FREE Utilities and Tips to Tickle your Curiosity. Best of all, this includes 2 Legal Award Certificates of Achievement for you the Student Graduate so when your finished you can hang them in your office. Over 40 Chapters of excellent information worth thousands of dollars and all this for only $29.95. Regular price $39.95. Don't miss out on this great opportunity. Buy yours today and be on your way to a great new future in computers!